They are behind some of Australia’s hippest micro roasters and cafés and now Russell Beard, Ping Jin Ng and Mark Dundon are gearing up to debut their first hotel project, the Paramount House Hotel. Set within Sydney’s Surry Hills neighbourhood, two buildings – the original 1940s former headquarters of Paramount Picture Studios and the adjoining film storage warehouse – have been stitched together by Melbourne-based architects Breathe, to house 29 rooms, a new restaurant, and a wellness space to the already existing residents which include the Paramount Coffee Project Café, the Golden Age Cinema & Bar and chic co-working area called The Office Space. A newly added rooftop copper-clad extension to the warehouse creates visual drama from the outside, while inside, it functions as a privacy screen casting strips of sunlight into indoor-outdoor terraces. 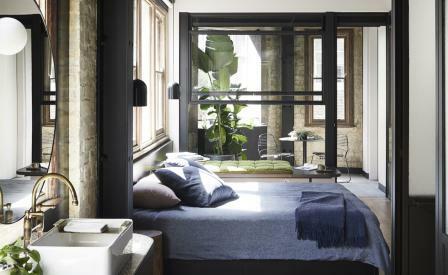 These lead into the guestrooms, where an industrial palette of concrete ceilings and bare brick walls are softened with colourful wool rugs, tactile low-slung furniture, and terrazzo-lined bathrooms. Coming soon will be a curb-side dining room from the team behind the city’s hottest restaurant, Ester.